The Australian Embassy to Laos on 26th of January awarded five awards to recognise outstanding contributions to Lao – Australian relations at its National Day and Lotus Director,Dr Phoudalay was one of those five people! Dr Phoudalay Lathvilavong has a long history of working with Australian Agricultural Experts to support small holder farming families and supporting girls’ education in southern Laos. Her award was to specifically to acknowledge her for the valuable contribution she has made. Dianne Gamage was honoured to be included in her supporting her nomination for the award and attending the award ceremony in Vientiane on Thursday January 26th this year. 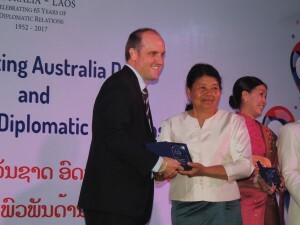 Australia remains one of Laos’ main development partners, with Australia’s programme focusing on education and human resource development, trade and business reform, rural development, and management of agricultural and natural resources.